CAOS Conflict Management provides conflict coaching for bullying behaviour, whether the client feels they are the 'victim' of bullying or have been described as the 'perpetrator' or 'bully' - by themselves or others. The purpose of conflict coaching at all times is to support the client in considering other ways of responding to a difficulty they are experiencing, if they are finding that their present responses are not working for them. 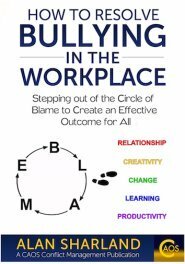 In the workplace - for managers or others who are felt to be acting in ways others find aggressive/intimidating etc. but also for those who feel bullied by someone in their workplace. In schools - for staff or students/pupils who feel that others in the school are bullying them - but also for those who have been described as a bully by others. In relationships - where someone feels bullied by their partner - but also for those who have been described as a bully by their partner. 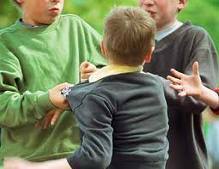 For someone who feels that they are experiencing behaviour they would describe as bullying, the support of conflict coaching can enable them to find ways of responding that reduce or even eliminate the sense of intimidation, fear, confusion, anger, despair and other difficult feelings that arise when the behaviour occurs. One of the difficulties that exists around bullying is that there is not a shared 'definition of bullying'. Different behaviours can seem like bullying to different people but the common factor that exists for all those who experience this is that there seems to be no way out, no escape. Conflict coaching supports the creation of choices in how we respond to a difficult situation. When we recognise that we have choices we are more likely to feel a sense of greater personal power in a situation. This can be the first step towards creating our own way out of the experience of bullying. When the focus in any difficult situation is on 'the other person', we can lose a sense of who we are and what we are able to do for ourselves. We can become dependent on knowing and watching the behaviour of the other person and forget about caring for our own needs and making our own autonomous, independent choices. Conflict coaching for bullying helps the client to 'come back to themselves', to reflect on their feelings, thoughts, and the responses that arise from these in relation to the other person, who they feel is bullying them. Having a safe space in which to do this offers the opportunity to consider alternatives to their present responses, with a focus on those which will provide the greatest level of self-support. What is important in all conflict coaching is that the client creates these alternative responses. If the conflict coach provides 'techniques' and 'suggestions' the dependency and sense of powerlessness is likely to remain. This approach, reflected in all CAOS Conflict Management support, can be challenging for the client - but it can also be an immense opportunity for empowerment and a release from the fear, anger, frustration and despair arising from the experience of bullying. 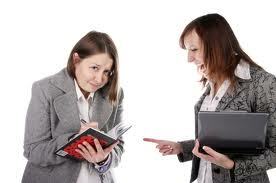 If someone comes to conflict coaching having been told they are a bully or even believing this to be so themselves, the sessions provide an opportunity to reflect on what leads to this perception and, if they decide that they agree with this perception, how they can change their responses to people such that their actions are more constructive and supportive of the relationships they have with them. Whether this means a review of how they express their anger, or how they use language, or what they believe about others and how they should deal with difficult situations, as well as other aspects of their relationships, the focus and challenge of conflict coaching for bullying will be for the client to take ownership of how they are responding in such situations having acknowledged that their present responses are not working - for themselves, and, they have come to understand, for others. Our role as Conflict Coaches is not to judge or condemn actions the client may have taken in the past, but to honour and support the willingness of the client to seek more effective ways of responding and communicating in their difficult situations in the future.